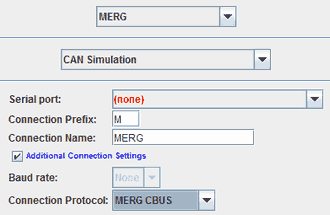 This page describes technical details of JMRI's MERG CBUS connection support. JMRI's general approach is to support as many hardware combinations as possible. By supporting as many people and their hardware desires as possible, we can create a growing community of developers, hence more code. As part of this, the JMRI CAN support is designed to use as many CAN adapter types as possible. Not many PCs have a RS232 serial port now, however is still supported. Where USB interfaces are used, the Baud rate is irrelevant. 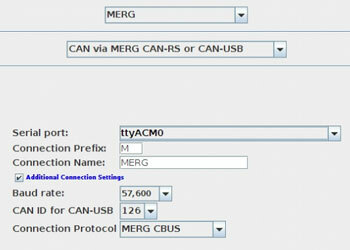 All MERG CBUS modules need a CAN ID, and JMRI is no exception. 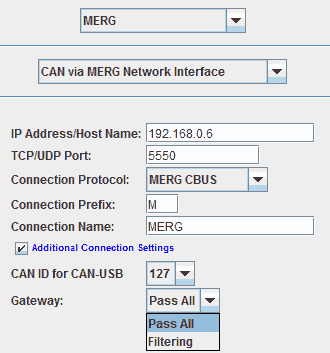 The CAN ID is separate to any NODE ID's used in MERG CBUS Long Events. Node numbers are for MERG CBUS long events, CAN ID's are purely for the CAN protocol transmission and are largely irrelevant in JMRI processing MERG CBUS events. 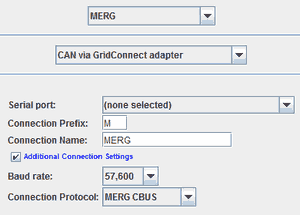 Most MERG modules can do "enumeration" for MERG CBUS, but some other adapters can't because of their intrinsic latency. Their slow replies effectively make them invisible. Therefore Mike Bolton, one of the MERG CBUS developers suggested that JMRI use a CAN ID of 126. That's a fixed value in some systems. If you have multiple copies of JMRI attached to a MERGCBUS network, be sure to give these unique CAN ID's. 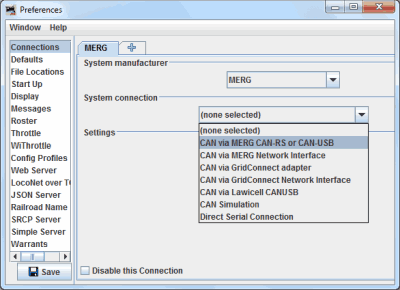 A CANUSB4 should not normally require special drivers to be installed, it should just work. If using a MacBook Pro running Mojave and are struggling with drivers for a CANUSB / CANUSB2, the appropriate driver is available from FDTI for the UM245R, the VCP option. Default setting shown on right hand side after the " : "
Serial Port - Select the serial or USB port that your CAN interface is plugged in to. CANPiCAP - The canpi service has to be active to accept connections. IP Address / Host Name : ( none ) - enter an IP address for fully manual configuration. Optional hostname for ZeroConf / mDNS configuration does NOT currently work, use IP or localhost. "localhost" can be used on most systems if the CAN server is running on the same machine. 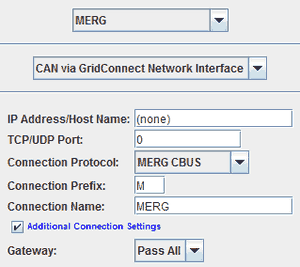 IP Address / Host Name : ( none ) - enter an IP address for fully manual configuration. Optional hostname for ZeroConf / mDNS configuration. A simulated Command Station is started for this connection, see CBUS Simulation Tools. 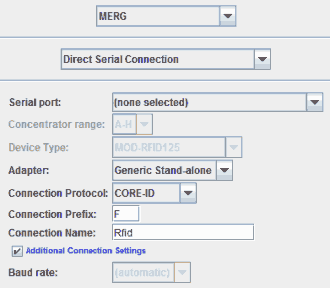 Serial Port Select- Choose the serial or USB port that your CAN interface is plugged in to. Alternate option - Olimex, enables a device type of MOD-RFID1356MIFARE in the device type dropdown.